Most churches that send a member oversees as a missionary only send one missionary during any generation of that church’s life. If every church sent one missionary to an unreached people group during each generation of its life, we could see the term “unreached people group” become obsolete. But only doing something once presents at least two challenges: (1) there is no opportunity to learn from past experience and (2) the plan for assessing, training, sending, and supporting the missionary is put together on-the-fly. The result can be: (a) a subpar preparation for being a missionary and, thereby, less church-planting effectiveness, and (b) an over-reliance on parachurch organizations that can leave the missionary on the field feeling isolated from the church that was a vital part of their calling. This project is an effort to fill that gap. It contains the sending strategy of The Summit Church, which was compiled in consultation with other churches that have the opportunity to send hundreds of individuals to serve as missionaries in unreached people groups. Our goal is to provide a resource – and commentary on how to use that resource – so that every church can effectively walk with every member willing to take the gospel to an unreached people group before (assessing and training), during (sending and supporting), and after (receiving) their time as a missionary. In this section we want to provide the big picture for the program below. The first video provides an overview of the four pathways to the mission field at The Summit Church. We hope you gain a more robust understanding of the possibilities that exist for having church members take the gospel to the ends of the earth. As a church begins to see these possibilities, it begins to create a life-on-mission culture throughout the church. 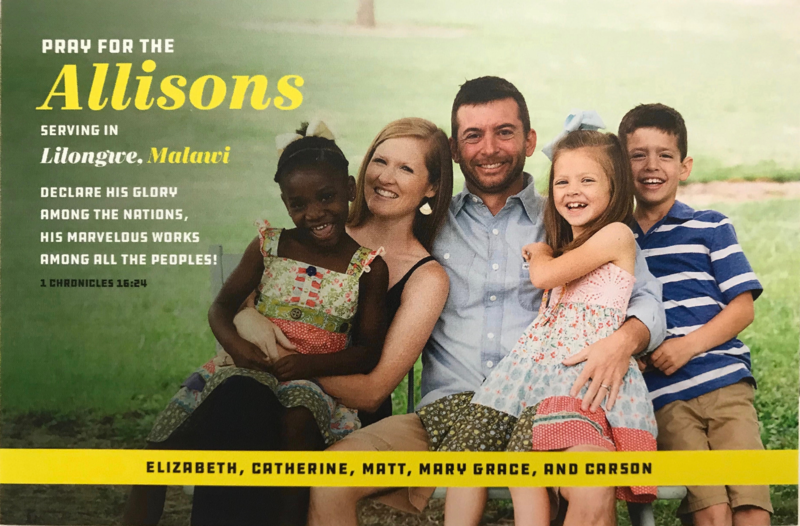 The second video provides an overview of the 5 phases, which serve as the outline for the rest of this project, an individual or family goes through at The Summit Church as they move from considering a potential calling as a missionary until they return from the mission field. The first part of caring for a missionary is helping them assess their calling, competency, and spiritual-emotional-relational health. We serve (a) each potential missionary and (b) entire mission teams well by carefully vetting candidates. Our passion for the idea of missions cannot cause us to take shortcuts in the assessment phase. Assessment for being a cross-cultural missionary cannot be a point-in-time measure. The qualities above need to be evidenced (a) across an extended period of time, (b) in a variety of settings, and (c) with different types of people. This assessment should also not be done by one person, or one type of person (e.g., pastors-elders). That is why The Summit Church’s assessment phase is done in four steps, over an extended period of time, and includes the voice of several different groups of people. It is important for a church to train more people than it sends (at least, than it sends in a long-term capacity). If a church is going to send and support a missionary well, it needs to be filled with members who passionately understand what it means to be a missionary. For this reason, the first two segments of training listed below are recommended to be open to the congregation as a part of your general discipleship ministries. “Explore Missions”: This is a 6 week study created by the IMB for churches to use in their various discipleship context. 1-2 Years from Departure: These 9 lessons are taught as part of a missions cohort that church members who want to explore the possibility of being a missionary can join. When a member of your church is considering a calling to the mission field you can each watch these and debrief them together. Here are the PDF notes for each of these presentations. 6-12 Months from Departure: This is a 6 month daily reading plan recommended by the IMB for those who are preparing to move overseas in their immediate future. This is the briefest phase by duration of any of the five phases. It is the celebration of and commitment to, both by the missionary and congregation, the missions endeavor ahead. This is another moment to catalyze a missions culture in your congregation and to remind the church-at-large of our commitment to “hold the rope” for those being sent. Below you will find key resources we use at The Summit Church in a sending service. This is the phase where the missionary leaves your geographical proximity; meaning (a) you no longer have ease-of-contact, (b) culture shock moves from a concept to an experience, (c) there is a much larger possibility of having an expectation gap, and (d) there is a greater opportunity to neglect care because physical closeness does not prompt your memory. Below we outline three key people/groups involved in supporting a missionary overseas. Each person or group needs to review their job description with the missionary before anyone gets on a plane. 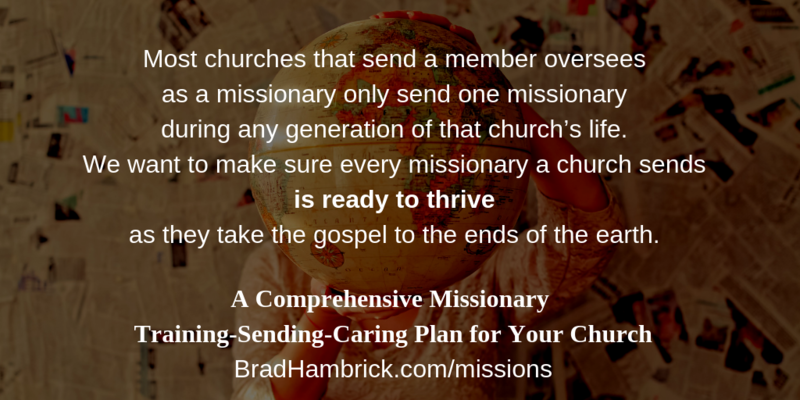 This may be the most neglected aspect of missionary care. When we neglect receiving a missionary as well as we sent them, it can easily result in the missionary feeling used and create a myriad of hardships and temptations for them. We easily forget our church has been incrementally changing as our missionary friend as been away. This means we often fail to see how different the church our missionary friend will be returning to actually is. Below is the process document for Summit’s “Receiving” strategy that your church can implement.